Author: Selbut Longtau. Series edited by: Roger M. Blench. 17 pp. Roman, 241 pp. The Tarok people are found mainly in Langtang-North, Langtang-South, Wase, Mikang and Kanke Local Gov­ernment Areas (LGAs) of Plateau State in central Nigeria. Their main town of Langtang is located about 180 kilometres southeast of Jos, the state capital. They are found in large numbers in Shendam, Mikang, Qua'an-Pan, Kanam, Kanke and Pankshin LGAs. Tarok farming communities are also scattered in Nasarawa and Taraba states. 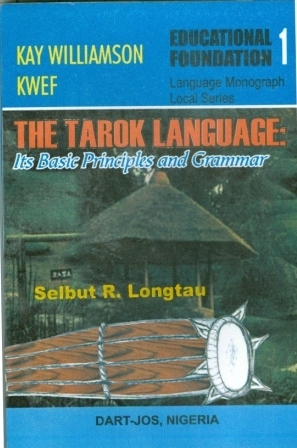 The Tarok call themselves o'Tárók, their language iTárók (Benue-Congo language familiy) and their land ìTàrok. 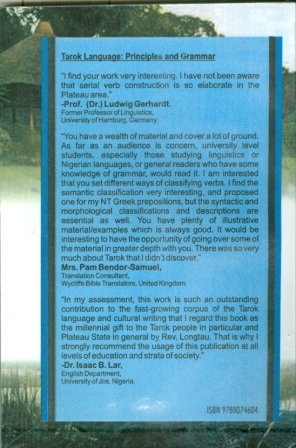 The focus of this book is a description of their language.